Black+Blum's unique Loop Chrome & Copper Candelabra will throw you for a loop! Graceful yet edgy, it was created by two European designers who are determined to show the world that great design doesn’t have to break the bank. That’s the general idea behind many of Black+Blum’s Loop collections, actually! These pieces are designed to be truly original, to in turn create for you an original home. 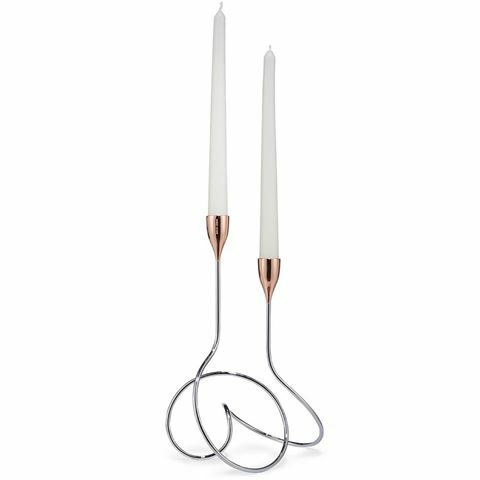 With a natural and satisfying sense of balance, this candelabra combines the faultless beauty of chromed metal with the warmth of copper to create a candle holder that is exceptionally unique and striking. Whether it’s a centrepiece at a special dinner or an everyday object of display in your home, the Loop Candelabra brings all occasions to life. Intriguing from every angle, the Loop Candelabra combines the energy of an uncoiling spring with the randomness of absent-minded scribble, and polishes it to perfection for an opulent feel. Crafted from chromed steel and copper. Holds standard tapered candles with a diameter of 22mm to 24mm. Presented in a Black+Blum box.